1. Mix cream cheese, picante sauce and chopped dried beef and 1 cup of the grated cheese until creamy. Place one tortilla on serving dish ans spread with a layer of the mixture. Repeat this process until you have a stack of 4-5 tortillas with cream cheese layers between. Repeat with remaining tortillas. cover each with plastic wrap and refrigerate overnight. Cut into wedges to serve. Sprinkle with additional grated cheese and paprika. 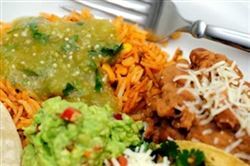 If desired, serve with sour cream, guacamole, or extra picante sauce on the side. Enjoy this delicious Mexican appetizer recipe!